Shell berths A´, A and B; YPF berths C and F; DAPSA berth E.
1) A new external finger pier lying 070º -250º, length 336 m with central loading platform and berthing dolphins permitting vessels to berth on either side. These are berths A´ (A prima) and A. 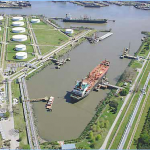 2) The original internal basin, length 616 m, entrance width 103 m with four “T” head jetties and adjacent dolphins. These are berths B, C, E and F.
The Shell berths are fitted with central cargo arms, TV monitoring, quick release mooring hooks (A´ and A) with extensive fire fighting installations and spillage equipment. *Coastguard regulations stipulate máximum beam 32 m but exceptions as indicated above have been granted. Loading -discharge rates vary with product e.g crude maximum 2000 cbm per hour. Gasoil 600 cbm per hour. available, preadvice required. 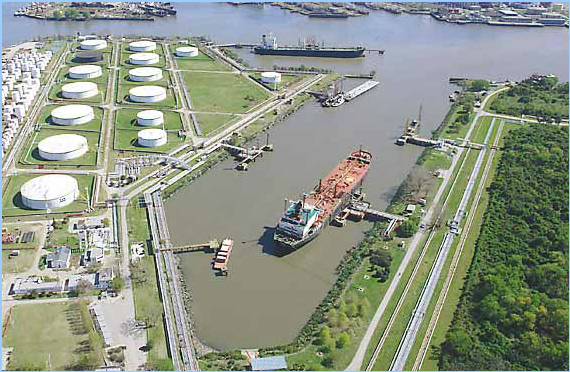 Limitations regarding LOA and beam at YPF and DAPSA berths in inner basin depend on what other vessels are operating or expected and is agreed between operators. Vessels of up to LOA 230 m / 55.000 ton Dwt have berthed. All vessels required berth bow out and operators should be consulted regarding pumping capacities, operational details and maximum drafts.